You are here: Home / Announcements / 2013 Australian Open racquet giveaway! My my my, I can’t believe that it’s that time already! 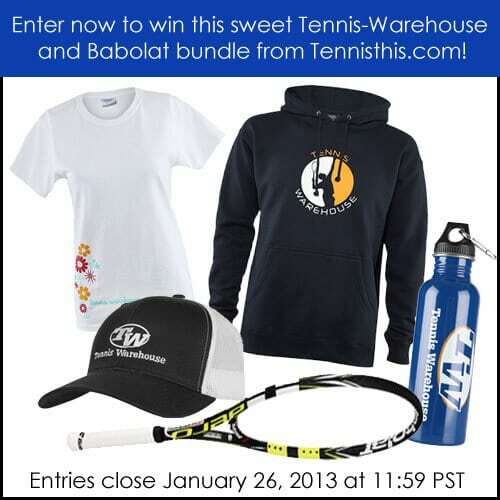 The Tennisthis.com 2013 Australian Open racquet giveaway is here! 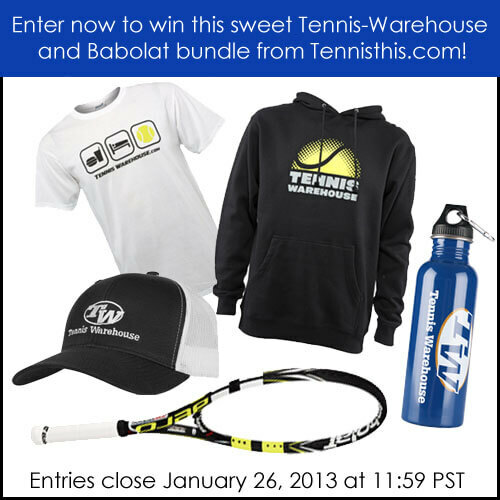 Starting 12/4/12, you can enter to win some pretty sweet tennis gear! For the 2012 Australian Open, one lucky winner received a brand new Wilson BLX ProStaff Six.One 90 (Roger Federer’s choice of racquets), 2013 is going to be an even bigger giveaway! 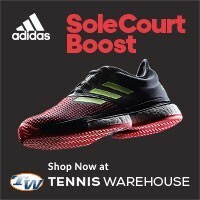 I’ve partnered up with Tennis-Warehouse.com for this giveaway, TW has been kind enough to throw in some pretty sweet tennis merchandise as part of my 2013 Australian Open racquet giveaway! Step 1, please leave a detailed comment of your favorite Australian Open memory*. It can be any match, anything on the ground, commentators, whatever you think was the best moment that you can remember. Step 2, share this contest using the fancy share buttons at the top and bottom of this post. 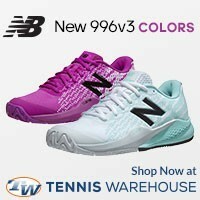 Step 3 (optional), sign up for the TennisThis.com weekly newsletter. Step 4, watch the 2013 Australian Open! Entries close 1/26/2013 @ 11:59 pacific standard time. Only 1 winner will be selected. Winner will be selected by random computer program after the men’s final match** on January 27,2013. Winner will be contacted privately by Tennisthis.com (please make sure you are using a VALID email address that you check regularly) to discuss apparel size and racquet model and grip size. Winner will have 24 hours to respond after being selected, if winner does not respond to email another winner will be selected…no exceptions. Winner will have to provide a picture of their winning to be posted on Tennisthis.com. If you are an international entrant, you agree to pay for international shipping and any other taxes or fees if you are selected as the winner. By entering, you agree to the above. Good luck to you all and I look forward to selecting a 2013 Australian Open racquet giveaway winner! 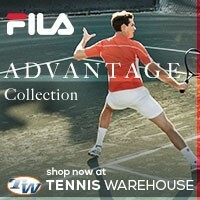 I would also like to thank Tennis-Warehouse.com for their contribution for this sweet giveaway! My favorite Australian Open memory is actually from this ongoing one. My mom, little brother and I stayed up all night to watch Federer play Tomic. To pass the time, we played Trivial Pursuit and drank pots of coffee. When match time finally arrived, we were so slap happy from being tired and filled with caffeine that we got a call from the neighbors from cheering during the points. We ended up crashing in the living room with all the lights still on and are teeth stained with coffee and popcorn. It was a night I’ll never forget. My greatest memory is in 2013. It was Roger Federer vs Jo Wilfred Tsonga. Everyone I knew thought Federer was too old but I still bet $20 and what you know I won over $100 in the bet. This is really true. My fave was Roddick vs El Aynaoui in 2003 because it was such a long match. So many great tennis moments at the Australian Open. I’ve been following the 2013 Australian Open like a crazy person. I cannot believe (although I’m super proud of Murray) that Murray beat Federer. The match was just so back and forth that I just couldn’t leave the screen. He got the first set 6-4 then was down in the second 6-7 then popped back up 6-3 then was down… I can’t wait to see the match between him and Djokovic! Sharapova against Li Na! Li Na is such a fighter and I’m glad that she’s made it so far in tennis! This is a new memory. I really liked the match between Sloane and everyone she has played in this tournament. She’s really great to watch and her personality only makes me like her more. My favorite memory of the Australian Open was the match between Agassi and Sampras because they are my favorites! My favorite moment was the 1995 Sampras/Courier quarterfinal. Sampras’ coach Tim Gullickson was stricken by a brain tumor and the normally stoic Sampras was visibly upset. Courier graciously allowed Sampras the option to continue the match the next day however Sampras focused and won the match. Though Sampras lost in the final to Andre Agassi, the match’s backstory elevated a sporting event into what it means to be truly human. There are so many great Australian Open Moments. I’m super disappointed that Nadal couldn’t play this year. He’s one of my favorite players and it’s always so much fun to see him play. The 2009 Aussie Open was my favorite just because Federer and Nadal are such great players and seeing two amazing players duke it out for such a great honor in tennis was really fun to watch. I always have a new favorite memory and this year’s Australian Open was simply amazing. The match between Ferrer and Almagro was the one that held my attention. It was such a battle between the two and such a close match. The deuces went on forever and seeing these players fight so hard is why I love tennis. There are so many chances to keep fighting. My favorite memory of the Aussie Open was from last year when Baghdatis was playing with Stan Wawrinka and on the changeover Baghdatis took out four of his racquets and broke all of them in under a minute. my favorite australian open memory was the 2012 final because it was the longest grand slam singles match of history. My favourite Australian Open was the 2008 series. I likes this series because out of nowhere, Tsonga (unseeded at the time) beats many seeded players, including Nadal, even in straight sets, and then makes it to the final. Unfortunately he lost the final, but that was a great appearance by Tsonga. He came in with no expectations by any spectator or commentator and proved them all wrong. Thats why he is one of my favourite players. As Federer is my favourite player, all of his games come second, and I love watching all games of his. He tries to hit faults to the ball boys, and he is generally a nice guy, and great player. Hopefully he wins this tournament in 2013! I only wish Nadal was playing as I am also a big fan of him and it would have been great to see him in the mix. I have shared and signed up too. No doubt it is 2012 men’s final! A six hour game without any dull moment ! I think it is their excellent sportsmanship that make the game a legend. No doubt about my favorite moment – Nadal vs Djokovic mens final 2012! Almost 6 hours of great tennis and sportsmanship! That’s what tennis and sports in general is all about! Favorite moment was in ’08 when djoker was called out in post match interview to do some impressions where he did a classic over exaggerated wedgie pull for rafa= funny stuff. It took some marbles to do that but he lived up to the great nickname of djoker. And Oh yea he played some great tennis that tourney too- 1st slam! My favorite thing about the Australian Open is watching what years of practice can do for a person. And I also love how aggressive two players are on the court but when the time comes to shake hands and accept victory and defeate you see nothing but love and respect. My favorite moment was when Nadal and Djokovic played in the mens final and the game went for 5 hours and 53 minutes! That proves how much stamina the players have! They both had a reason to be tired after that! Federer and Nadal have always been my two favorite players. They have completely different playing styles but make the game so fun to watch. The 2009 match would definitely be my favorite and most memorable match. Federer was so close to reaching his goal of record number of grand slams. Both players played phenomenally. Well I have so many favorites of the Austrailan Open. 1. Agassi vs. Sampras 1995(awesome) 2. Agassi in 2000 and 2001. I’m a fan. Love Tsonga and Novak this year. My favorite Australia Open HAS to be the final grand slam between Djokovic and Nadal last year! It was just nerve-wrecking to watch their rallies. I actually started to sweat just watching. My favourite aussie open was when marcos baghdatis smashes FOUR racquets!! Was a great moment during the match between Federer and Nadal when a ball boy with sharp reflexes catched the ball that Federer stroke to him because of his first serve was fault. Was his “moment of glory”. 2009 woah what a year! The semis with Rafa and verdasco were amazing. The rallies, the effort, and the skill just blew me away. True tennis. My favorite Aussie Open Moment was the 2012 men’s final. There was so much going on on court. The rally’s were so amazing. The Speeches were so funny. Rafa and Novak were so tired that they were sitting on the net during the ceremony. Because it’s the last final and because it was up to 6 hours is a easy issue to answer. But any great tournament is full of great moments and great rivalries. It’s hard to say which of the all the Aussie Open tournaments, though I would have to say when Marco Baghatis made a very impressive run in 2006 where he reached the finals. He brought so much electricity to his matches, pumping up the crowd. It was intense! It’s too bad that his talent kind of fizzled in the years after that, never reaching his full potential. Nonetheless, that was one of the most memorable times for me. 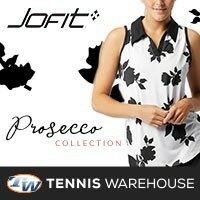 It’s great to see tennis-warehouse throwing in some stuff for your giveaway! This is by far one of your biggest. I really love the Australian Open because it is one of those tournaments that truly tests mind and body. The intense heat and just everything combined shows the greatness of the sport. Although I love Nadal and Djokovic my favorite australian open memory was when I saw Joachim Johansson play Feliciano Lopez. There were just so many aces during that match and it just felt wonderful watching two players have such an on game. With all the pressure and external factors it was just just refreshing to see that. 2012 Nadal Djokovic Australian open final was my favourite because of the twist and turns in the match. At any moment it was difficult to guess the winner and in the end it was matter of last man standing. by the way the camera work and slow motions were outstanding as well. My favorite moment in the Australian Open was the 2012 final between Rafael Nadal and Novak Djokovic. I have a bias for Djokovic, as he is my favorite player at the moment, but the 6 and 1/2 hour match was simply a remarkable feat by both players. finals for 2012 nadal vs djokovic was crazy. awesome match to watch. Oh nice, love these giveaways! I think my favorite part of AO was when they had the Hit for Haiti and Rally for Relief charity matches in 2010 and 2011. They are enjoyable to watch cause it was just all of them having a good time and showing off with some crazy skills. The one on one match between Federer and Nadal is always a good show, followed by the top men and women players goofing around by doing things like grunting in an exaggerated manner or getting into a volleying match. My favorite part was when Nadal hit a slice near the net that was unretrievable because the wicked spin he put on the ball caused it to jump back to his side. I love the fact that they just love to play whether it’s a real match or not. It’s so good that I watch videos of these charity matches online from time to time. My favorite australian open moment was djokovic vs nadal i watched the entire thing yay!!! The 2012 Australian Final was my favorite because it was very exciting and fun to watch. My favorite player is also Djokovic so it was a win win. My favorite moment was when Djokovic and Nadal had their nearly 6 hour match. You could see how mentally and physically exhausted they were but they just showed how much passion and dedication they had towards the sport. In an ideal world they would have both gotten first place but it was just an overall amazing match to watch. The 5 set matches this year between Djokovic and Murray, and then Djokovic and Nadal were great – both were so close, and really exciting… despite wanting Murray to win in the semi, and Nadal to win in the final!